Smilow Cancer Hospital at Yale New Haven is part of the nationally recognized Yale New Haven Hospital, and is affiliated with Yale Cancer Center (YCC), one of only 49 National Cancer Institute (NCI)-designated comprehensive cancer centers in the nation and the only such center in Connecticut. Mohamed Badawi is a radiologic engineer-physics at Smilow and part of a team of three engineers in the radiation physics department. He gets kudos from his boss. “Mohamed is a key member of our in-house engineering team, well-liked by physicians and staff. He has consistently demonstrated his technical capabilities and dedication in providing timely and high-quality engineering support for our department at the New Haven, Guilford and Hamden campuses,” says Zhe (Jay) Chen Ph.D., chief physicist. “Mohamed has consistently led the engineering support for several major projects (e.g., ExacTrac upgrade, C-Rad installation/troubleshooting, LAP laser install at New Haven and Guilford campuses, etcetera) that occurred this year. In addition to project coordination, supervision, and technical support, he often has to stay late or work on the weekend to ensure successful completion of a project. This year, he has also completed vendor-provided training courses for Varian Truebeam. Mohamed is a role model for our engineering team and we are happy to have him on our team,” Chen says. Badawi began his college studies focused on mechanical engineering but found it too dry. “After extensive research in the other types of engineering, I came upon biomed/imaging engineering. It stood out to me because it involved almost every other kind of engineering out there. It involved mechanical, electrical and computer, just to name a few. Working with these different types of technology was exactly what I was looking for. It was also very rewarding knowing that I would be contributing to patient care,” Badawi says. He gathered up some on-the-job experience before working for Smilow. “When I first started my career I took a job at Covidien Healthcare (now Medtronic) as a research and development technologist II. Then, I took a job at GE Healthcare as a biomedical technologist II. After GE, I got into imaging when I took a job with Trimedx as an imaging engineer. 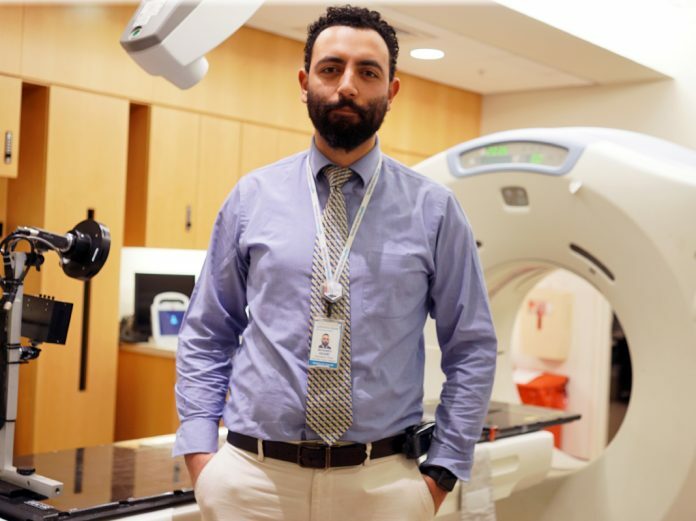 Now, I am specialized in linear accelerators as a radiologic engineer at Yale New Haven Health,” Badawi says. He says that from the beginning of his career he has been amazed by the complexity and the ingenuity of imaging systems. “I started studying the technical aspects of different imaging systems while I was working as a biomed until I eventually moved to an imaging position where I received official training,” he says. His growing knowledge included more specialized imaging training through RSTI. “When I started my first imaging position, I completed the four-part X-ray certificate series from RSTI. The program provided me an extremely detailed and in-depth understanding of X-ray production and X-ray physics,” Badawi says. Badawi believes that when tackling projects, including installations, the prospects of a good outcome increase by preparing your mental game the right way. “The biggest challenges that I see in the imaging field are standardizing practice and protocol. Recently, I have been leading numerous new installations and system upgrades throughout the health system,” he says. “I work in a busy cancer center that is constantly seeking new technology to better patient care. From an engineering side, I led the installation of two new C-Rad catalyst systems and one Sentinel system. The biggest challenge in any new installation is to get all the parties (electricians, carpenters, iron workers, OEM engineers, IT team, facilities personal and project managers) on the same page and to coordinate a schedule accordingly,” he adds. “From working on previous projects in the past, I found that if you write your successful outcomes and failures, you can create a template for yourself. This way, moving forward, you can anticipate challenges that might arise and minimize mistakes,” Badawi explains. “Make a plan for yourself and set a projected finishing date before the final deadline. Use Outlook, iPhone or Android to set frequent reminders to stay on track. Send the plan to all parties involved in the job and follow up via email for confirmation. Always create lists. Use sticky notes over your monitor or put them in a place where you can see them. Send out calendar meetings, updates and reminders constantly with any new information along the way. Try to set a finishing date with all parties involved before the final deadline to work out any problems that might arise. Before the end of your shift, write down what you need to do for the next day,” Badawi says. “The idea of putting a ‘template’ [in place], is to have an organized structure and to avoid any mistakes that you have made in the past. It works for me every single time and it just keeps getting better over time,” he adds. Badawi says that one important facet of work life for him is to continue learning. “I am a motivated individual who loves to provide unique solutions that deliver efficient outcomes. I believe that success only comes when you take ownership and work for higher results each time you do the job. I enjoy what I do and I love coming in to work every single day; I always have a positive attitude on things even if the situation might seem anything but,” he says. “I believe if you want to become a leader and implement positive thinking then you have to act like one by taking responsibility and leading by action. Education is very important to me, I am currently studying to complete my master’s degree in healthcare management. I always urge people in the field, to constantly further their education no matter how long they have been in the field; everyone can learn something new,” Badawi adds. On the home front, and away from work, Badawi enjoys his family and getting outdoors. “I am happily married to my beautiful wife, Umayra, and have two little munchkins — Ahmed two and a half (years old) and Aisha six months old. They are my world. Everything I do is for them,” he says. “I am a guy who loves anything that will take me outdoors and connects me with nature. Specifically scuba diving, camping, fishing, and exploration,” he adds. Smilow Cancer Hospital is fortunate to have an imaging professional who is so self-motivated and structured in his approach. Why should this person be featured in ICE Magazine?